Proper pruning of landscape trees improves their structural strength, maintains their health, enhances their beauty, and increases their value. Why Should Trees Be Pruned? Landscape trees not only make homes and communities more beautiful, but they also improve our environment and can increase the value of a property up to 20 percent. Trees are truly assets that need to be enhanced and protected. Proper pruning is definitely a worthwhile investment! Crown thinning a tree removes unwanted branches, reduces weight, and allows light and air penetration. 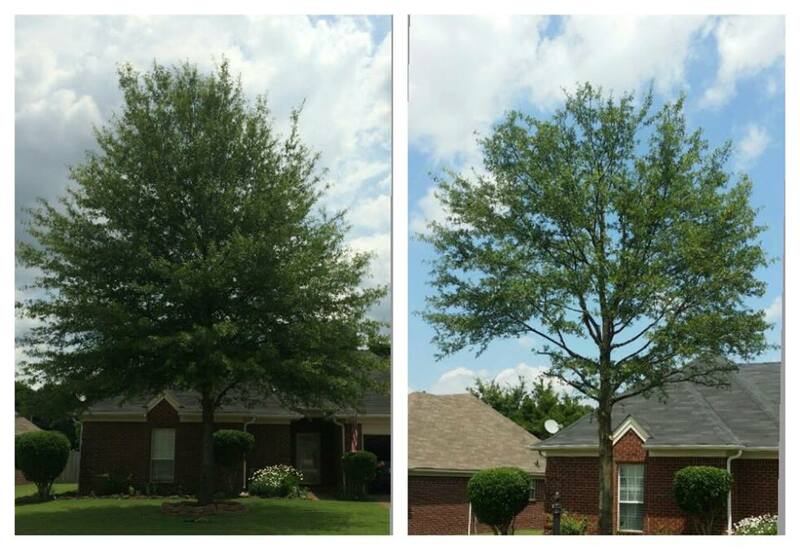 If properly done, thinning increases a canopy’s photosynthetic area. Who Is Qualified to Prune Trees? Simple types of pruning, such as cutting lower branches from small trees, can be done by anyone who understands plants and has the proper tools. But only qualified arborists should train young trees or climb into trees to prune them. That type of tree work requires knowledge of scientifically based pruning techniques, tree physiology, and safety practices, as well as working experience with various tools and tree species. Because proper pruning is complicated and examples of shoddy and unsafe work abound, national standards have been developed for the best methods and safety. Any potentially hazardous activity associated with climbing trees, using power tools, and especially working near electric lines should be left to qualified professionals who follow the national tree safety standards. This circular offers guidance for those who want to prune young trees. It also can help you find a qualified tree professional, understand proper pruning practices, and recognize work that is damaging to trees. A thinning cut removes a branch at its point of origin on the trunk. A reduction cut shortens a limb to a lateral branch large enough to resume the growth of the pruned limb (Fig. 1). Thinning and reduction cuts leave no stubs. They are used to remove damaged, dead, or weak branches, reduce the length and weight of heavy limbs, or reduce the height of a tree. Reduction cuts are placed so as to distribute ensuing growth throughout a tree and retain or enhance a tree’s natural shape. Reduction and thinning cuts are the proper type of cut to use in pruning a live tree. Reduction cuts on larger branches can be referred to as drop crotch pruning. A heading cut trims a branch back to a bud, or trims a branch or leader back to a small branch not large enough to assume the growth of the pruned branch. Heading cuts should only be used when pollarding trees or shaping terminal flowering plants such as roses; they should not be used for topping trees. Topping has been described as the “ultimate in destructive practices,” and in almost all cases it permanently damages a tree’s health, structure, and appearance. A stub cut is like a heading cut but is made indiscriminately to a point on a branch or leader where no bud or branch exists. A stub cut, like a heading cut, is used when a tree is topped. Topping is only appropriate when sections of limbs are cut off during the removal of a tree. Fig. 1. When using reduction cuts, always remove or shorten a branch to a side branch that is at least one-third the size of the one being cut. A branch that is 3 inches in diameter would be pruned back to a side branch that is at least 1 inch in diameter. Do not remove more than 25 percent of a mature tree’s foliage in any year. Topping of trees using stub cuts and heading cuts should not be done for several reasons. Topping reduces the ability of a tree to produce food. Shock and long-term declining health resulting from topping can make a tree more susceptible to insect and disease problems and can lead to its death. By removing the branches that protect a tree’s crown, topping can lead to sun scalding of remaining branches. The stubs and sun scalds resulting from topping cuts are highly vulnerable to insect invasion and the spores and actions of decay fungi. Numerous water sprouts resulting from topping are weakly attached and grow so rapidly that a tree can regain its original height in a short time with a more dense and unwieldy crown. With their natural form and beauty disfigured, topped trees are ugly to most people. Topping can reduce the value of a large ornamental tree by thousands of dollars. Although tree topping may cost less and take less time and knowledge than using reduction cuts (the proper pruning technique), you would be paying for an inferior service. Before pruning a young tree, it is important to consider the natural form and desired future growth of the tree. Some trees like pines and sycamores have strong central trunks and require little pruning. Others, such as oaks and maples, branch out more. Pruning should accentuate the natural branching habit of a tree and should also correct structural problems. By correcting any defect in the structure of a young tree, pruning helps develop a mechanically stronger and healthier tree. A few minutes of thoughtful pruning spent on a young tree can eliminate hours of costly future pruning on mature trees. Ideally, pruning should be done over several years, whether it is to provide clearance or to train a young tree. Prune as little as possible in the first two years after a tree has been planted, so there will be enough temporary branches and leaves to produce food for the growth of roots, trunk, and branches. Newly planted trees will gradually restore the balance between roots and branches; excessive pruning can be detrimental and delay normal growth. When a tree is planted, prune only broken, malformed, or diseased branches. Remove any double leader so that one dominant trunk is maintained. Removing branches before they exceed 1 inch in diameter will keep pruning wounds small. Clearance requirements are an important consideration. Street trees or trees along walkways and driveways must have limbs high enough to safely accommodate pedestrians and vehicular traffic, signs, and lights. Trees grow from the tips and the tops, not from the bottom. Branches that grow 6 feet off the ground will always remain at that height and may droop as they grow longer. If clearance is not a problem, keep branches on the tree to help the tree grow. The need to prune for clearance can be minimized by purchasing trees that have been nursery grown to street tree specifications. Thin or prune back any unusually long branch that competes with the leader for dominance. Remove any branch that crosses or rubs another, keeping the branch that conforms to the natural form of the tree. Thin out excessively crowded branches. Wide angles between the limb and trunk are stronger than narrower ones. Remove branches that have much narrower angles between branch and trunk than are typical for the species. Remove the lower branches to provide safe clearance and visibility, gradually over several years. Branches should be well spaced along and around the trunk of a tree. To correct defects or to thin out an overly dense crown, a young, vigorous tree can have as much as 35 percent of its foliage removed while the tree’s structure is being established. Avoid pruning trees from the time of bud break until leaves have grown to full size. Prune hawthorns, crabapples, pears, and other flowering trees immediately after flowering, thus allowing a tree to develop flower buds for next spring. Fig. 2. This figure shows examples of branches that should be pruned from newly planted trees. To promote good structure and lessen the need for future pruning, trees should be properly pruned during the first one to five years. Balance between roots and branching will be restored naturally, which is preferable to compensatory pruning. To promote root establishment and growth, as many branches as possible should remain. The ideal mature tree will have lateral branches that are 18 to 24 inches apart on the trunk and one strong leader. However, some trees differ, such as Japanese maple and other ornamentals, which are meant to have a more bushy appearance. It may take repeated pruning efforts over a number of years to attain an ideal structure. Remember to retain enough branches on the tree to keep it healthy and vigorous. Some types of trees have better branching habits than others. Branching also can be affected by nursery pruning practices. Many problems can be avoided by purchasing a high-quality tree of the right species that is suited to its purpose and to the site where it is to be planted. Properly prune your young tree to lower future maintenance costs and to create a beautiful and safe mature tree. Not all mature trees need to be pruned. Some only require pruning every 5 to 10 years. The need for pruning can be reduced by planting the right type of tree in the proper place and by properly pruning a tree when it is young. Pruning a mature tree excessively or incorrectly causes more damage than good. When a vigorous branch is cut from a tree, part of the tree’s ability to produce food is removed and a wound is created where decay organisms may enter. When you prune a branch, do not leave a stub or cut flush against the trunk. To remove a branch, make a slanting cut just outside the branch collar (the swollen area at the base of the branch next to the trunk depicted in Fig. 3). Fig. 3. To promote closing of a pruning wound by wound wood, always use the three-step or natural target pruning method when removing a branch. This pruning method protects the branch collar (the shoulder rings and swollen base of a branch) and prevents the tearing of bark. Do not leave a stub when you prune a branch, and do not cut flush against a trunk. Thinning cuts should be made with sharp tools and should be kept as small as possible, clean and smooth. Mature trees should only be pruned for specific purposes and in a manner that protects and preserves the tree’s natural form. Crown cleaning—removes dead, dying, diseased, crowded, weakly attached, or low-vigor branches and water sprouts. Crown thinning—selectively removes branches to increase light penetration and air movement and reduce the weight of heavy limbs. Crown raising—removes lower branches to provide clearance for buildings, vehicles, pedestrians, and signs. Crown reduction—reduces the size and spread of crowns using reduction and thinning cuts, resulting in fewer sprouts than heading or stub cuts, and maintaining the structural integrity and natural form of the tree (Fig. 4). 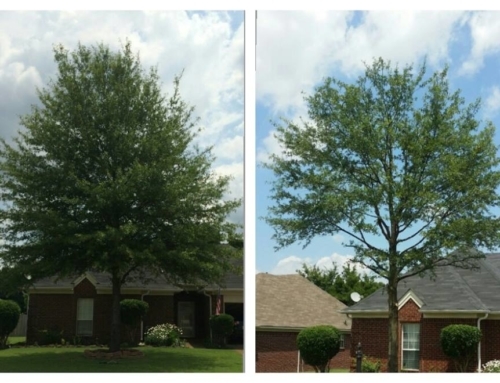 Crown restoration—improves the structure and appearance of trees that have been storm-damaged or deformed by heading or stub cuts. A qualified and reputable person or company should be hired to perform tree work, not an individual with a chain saw trying to make a fast buck. It is very difficult, if not impossible, to repair damage that has been done by poor pruning. In tree work, the old adage “you get what you pay for” is usually true. Tree care practices change based on the latest research, and will continue to change. It is important to hire a qualified arborist, preferably a Certified Arborist, who keeps up with proper, safe tree care techniques and will provide high-quality work at a fair price. The following guidelines can help you to select a qualified arborist and ensure proper tree care. Always have at least two or three tree care firms examine and bid on your tree work. Usually, these firms will do so at no cost. For referrals, contact a local municipal arborist, the cooperative extension office in your county, or the International Society of Arboriculture (ISA). Tree care professionals are members of professional organizations such as the ISA. Reputable tree service companies generally do not solicit door to door, as they rely mainly on repeat customers. If possible, include a certified arborist among those whom you contact to examine your trees. Arborists certified by the ISA have passed a test of their knowledge and must continue their education to maintain competency. Ask for a written estimate detailing the work to be done from everyone who examines your trees. Terminology used on bids should match the tree pruning guidelines and standards explained in this publication. If terms like topping or rounding-over are used, consider another firm. Do not blindly accept the lowest bid. Remember, in tree work a good job can be slightly more expensive. Try to schedule work in fall or winter, when rates may be lower. Ask to be shown proof of liability insurance and worker’s compensation insurance. Do not pay in advance, but wait until all terms of your contract have been fulfilled. Use the following information to ensure that your trees will be pruned in the proper manner and for the right reasons. Familiarity with pruning methods will help you hire a qualified arborist who will do the job right. Trees that can grow or fall into utility wires require special pruning practices. Utility pruning is designed to prevent interruption of electric service, improve public safety, and protect utility workers. Only specially trained line clearance tree trimmers are permitted to prune trees close to electrified lines that carry more than 750 volts, according to regulations of the U.S. Department of Labor Occupational Safety and Health Administration and the American National Standards Institute. If you plan to prune or remove a tree requiring a person, tool, equipment, or any part of the tree to reach within 10 feet of an electrified line exceeding 750 watts, the work must be performed by a qualified line clearance tree trimmer, or the utility company must be notified several days in advance so that proper safety precautions can be arranged. Wires leading from a pole-mounted transformer to a residential electrical meter generally carry less than 750 volts, but to be safe, check with your local utility company. Utility companies determine the amount of clearance that is needed between trees and electric lines to maintain reliable and safe service. Clearances between trees and wires depend on voltages that vary among primary and secondary conductors, and growth rates that differ among tree species. Professional tree service contractors are employed by utilities to prune periodically to specific clearances. Utility pruning practices changed greatly during the 1990s. Research has shown that tree wounds do not heal, but are compartmentalized both physically and chemically to prevent the spread of decay and closed by wound wood. Accordingly, utilities specify the placement of pruning cuts to utilize natural defense mechanisms of trees and promote faster closure of pruning wounds. Directional pruning, using thinning and reduction cuts, is used because it is better for tree health and structure than topping trees or leaving branch stubs (Fig. 4). In directional pruning, growth of branches is directed away from wires by pruning those that can grow too close, while allowing extension of branches that will not interfere with electric lines. Topping of trees with heading cuts is avoided, as it damages tree health and encourages vigorous sprouting that increases the frequency of pruning cycles. Also, the tunnel or side-wall effect of clearing a row of trees to a uniform distance sometimes can be softened by pruning some branches back various distances, even to the trunk. Fig. 4. The method for reducing the size of a crown is the use of small reduction cuts. Using larger reduction cuts that remove a large branch or leader to a large branch is commonly called crotching or drop-crotching. Even though large wounds may result from drop-crotching, this method of pruning is preferable to heading or stub cuts. Some trees will appear to be disfigured by the pruning practices of utility companies (Fig. 5 and Fig. 6). In particular, trees that previously were topped or rounded-over will be difficult to reshape with directional pruning. Any tall-growing tree that is under or close to electric wires cannot retain a completely natural shape and should be considered for removal if severe pruning is required or has been done in the past. Fig. 5. Trees under these wires were topped improperly several years ago. Vigorous regrowth of slender branches from the stubs of thicker branches grew into the wires, requiring pruning for clearance. Fig. 6. After directional pruning of the same trees, branches directed away from the wires were retained, instead of removing all of these branches according to previous practices. Much of the regrowth will now occur on those retained branches, without interfering with the wires. Although the shape of the trees appears unnatural in the winter, they will be more normal in appearance when covered with foliage and will be healthier throughout the year. Two alternatives can be used to reduce unattractive aspects of utility pruning and to lower line clearance costs. Both involve the replacement of large trees, either gradually or in groups, depending on the circumstances and preferences of people in the neighborhood. A formal street tree design with uniformly spaced trees of the same kind and size requires removal and planting all at the same time. An informal planting design can be implemented over several years, with less disruption in the appearance of the neighborhood. Trees that are replanted should be smaller species that will not grow into wires at maturity. The right tree for planting under utility wires should be no taller than 20 to 30 feet at maturity. Adequate space for root growth also is an important consideration in relation to tree size and placement. Low-growing trees are most appropriate if the space for roots between a sidewalk and the street is less than 4 feet wide. Medium-size trees, up to 45 feet at maturity, can be planted near utility lines (such as the other side of a street) if they are offset at least 15 feet from the nearest wire. Consider other open spaces away from utility lines for the placement of larger trees, being careful to plant them far enough away from buildings. Street Tree Factsheets, a publication available from Penn State, can help you choose the right tree to plant near or beneath utility lines. Many communities have developed constructive relationships with their utility company to optimize pruning practices and tree removals. Good communication between communities and utility companies will help reduce any problems, and a notification requirement in a municipal street tree ordinance can alert an official, tree commissioner, or municipal arborist of impending tree pruning or removal. A municipal representative then can talk with the utility forester to address any concerns, and thus improve pruning quality that meets community standards. Elmendorf, William. “Pruning Landscape Trees (Urban and Community Forestry).” Urban and Community Forestry (Penn State Extension). Web. 21 Feb. 2016.